BOO-TASTIC Fun at Adventure City this Fall! 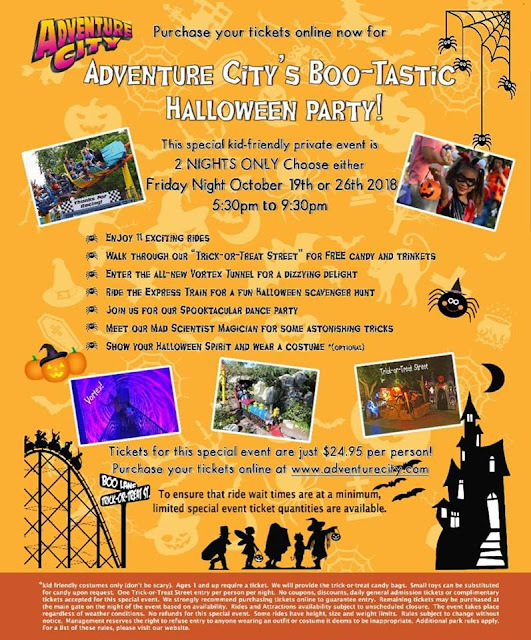 For only 2 thrilling Friday nights in October Adventure City is hosting a BOO-TASTIC Halloween Party on October 19th & 26th 2018. What's the BOO-TASTIC event all about?! * Walk Through Trick or Treat Street for candy and trinkets. * Enter the new Vortex Tunnel for a illusion to pass through. * Ride the Express Train for a fall scavenger hunt of surprises. * Rock out in the spooktacular dance party. * Meet the mad scientist and other friends of Adventure City. * Show off your Halloween spirit with a costume.. it's optional! * Limited tickets available to ensure wait times are at the lowest possible. The price is right! All of this all age friendly spooky thrills available for $24.95 pp. Two nights only so hurry and plan your fall fun with Adventure City on the list of must do. Enter to win a family 4 pack to experience this limited event on your select date! Thanks to Adventure City for the giveaway and happy Halloween fun all! Check back soon for our Autism Friendly tips too after a visit of our own.